A guest post by Bodil Bøjer, who presented at Transitions Europe and is an Industrial PhD candidate, based in the Design Agency Rune Fjord Studio in Copenhagen and enrolled at The Royal Danish Academy of Fine Arts Schools of Architecture, Design and Conservation. 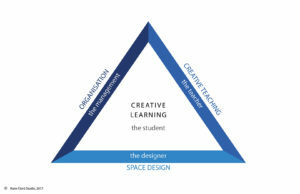 Her research examines the relationship between learning space design and creative processes by using a Research Through Design approach in several case studies. In recent years many schools are being built or rebuilt based on student-centred learning with smaller classrooms and large innovative learning environments (ILEs), expected to foster 21st Century learning skills. When designing new ILEs, the interdependence between space, teaching and organisation is widely overlooked as a new spatial design in itself is expected to change the way we teach and learn. However, simply changing the space is not enough (Imms & Byers, 2017) and the intentions of the space can only be fully realised if the inhabitants of the schools (teachers, students and management) completely understand and support the pedagogical principles informing the provision of these spaces (Burke, 2016). So how do we approach this challenge? One way to do this, I suggest, is by paying more attention to the alignment of the physical space, pedagogical practices and the organisation of the school. Preferably starting already before and throughout the design process, as well as continuously after the final implementation of the new ILE. Based on a research-based case study, I propose a participatory form of design processes where both users and management are included in the design process regularly to align needs, wishes and intentions continuously in order to assure ownership, quality and use of the space. In a Danish school near Copenhagen we designed a new ILE intended for both regular educational activities as well as after school activities. It consisted of different activity zones with both flexible and diverse workstations allowing for many types of activities and learning styles. A set of purpose-built furniture aimed at supporting the needs and ideas of this particular school as well as creative learning processes was especially developed for the space. Our intentions were to involve all stakeholders directly or indirectly through ambassadors during the design process on a regular basis to assure the alignment of space, teaching and organisation. In reality, this was not possible, because of budgets, time pressure and teachers’ workloads. Consequently, many teachers were unaware of the intentions of the final design and found it difficult to match to their usual way of teaching. Actually, they did not even know that they were allowed to use certain furniture and had no keys to unlock them. Therefore, we added a fifth phase to the design process with the purpose of handing over and activating the project in collaboration with the users in order to help them understand the spatial possibilities. Very often, the interaction between the creators and the users of the learning spaces abruptly ends as soon as the new design has been implemented, which leaves the users with a spatial design they might not know how to use. 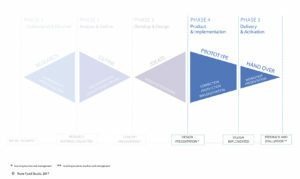 During the fifth phase of the design process, the intentions of the space are to be translated into actions and negotiated through participatory processes. It is presumed to be an on-going process where a common language and culture is established, because a school design is never totally finished. It constantly develops and transforms with its users. For more information see Bodil’s presentation at Transitions London 2017, follow her on Twitter/bodilbojer or visit Rune Fjord Studios website www.runefjord.com to see photos from the presented ILE and many other learning space design projects. Burke, C. (2016). Quiet Stories of Educational Design (K. Darian-Smith & J. Willis Eds. ): Routledge.